Since its founding more than 150 years ago, Missouri Botanical Garden has been committed to connecting people with plants in meaningful ways. 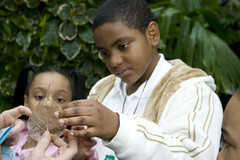 Today, education remains at the heart of everything the Garden does, from playing host to nearly one million visitors at its St. Louis area destinations to strengthening science learning and teaching for students and teachers to helping drive local and global communities towards sustainable living. With nearly 50 professional educators and more than 200 dedicated volunteers, the Garden’s education team share a common goal: To deliver exemplary, experienced-based education that increases understanding, appreciation and conservation of plants and the natural world, and inspires people of all ages, backgrounds and abilities to think and act in sustainable ways. Doris I. Schnuck Children’s Garden: Missouri people and plants take center stage as kids explore the natural world at the Children’s Garden. Look for hands-on learning and family fun throughout the Children’s Garden all season long. Open daily April through October from 9 a.m. to 5 p.m. Separate admission fees apply. Tower Grove House: Experience the Garden’s roots at Tower Grove House. Take a step back in time in the country home of Henry Shaw. View artifacts and furniture that belongs to Shaw. Explore timelines and discover how Tower Grove House was used after 1889. Listen to voices from the past and hear from those who helped build “Shaw’s Garden.” Open April through December, Wednesday through Saturday from 10 a.m. to 4 p.m. Included with Garden admission. Brookings Interpretive Center: This 4,300-square-foot interpretation center links the exhibits at the Garden with the Shoenberg Temperate House. Previously used as a permanent exhibit space, this venue has also played host to season traveling exhibits. Germination Stations: Interpreter-led “Germination Stations” enrich visitors’ experience with discovery and learning. These stations have been developed with a goal of “planting seeds and growing minds” in understanding of the Garden’s mission. Adult and student volunteers greet visitors on Garden grounds and in the Children’s Garden, engaging children and families in hands-on explorations. Topics change seasonally, including: the Power of Pollination, Bushels of Fun, Cave Experience, Wetland Wildlife Observations, What’s So Neat About Trees, Nature of Fun, the Rain Forest, Japanese Garden and Exploring with Carver. Walking Tours: Daily public guided tours of Garden collections with experienced Garden docents. Offered at 11 a.m. Included with Garden admission. Youth and Family Classes and Programs: The Garden offers a diversity of programs and experiences for families with young children, designed to encourage families to explore the wonders of nature together. Programs include Strollerobics, Little Sprouts (ages 2 to 3), Garden Buds (ages 4 to 6), Pitzman Summer Programs (ages 4 to 6) and special themed classes for ages 6 and older. In addition, on one Saturday each month, kids and their parents can drop-in for a Great Green Adventure (ages 6 to 12) to explore a different, special part of the Garden with the help of a Garden educator. Scout Programs: Girl Scout and Boy Scout troops can explore the Garden grounds as part of a Scout program or as a self-guided experience. Programs designed to align with Scout themes and badge requirements. Adult Education: Offered for a diversity of learners, from budding enthusiasts to skilled gardeners, the Garden’s popular series of classes for adults have been expertly designed to educate, inspire and enrich. Plant-inspired class categories include Gardening & Landscaping, Guided Walks and Tours, Arts & Crafts, Food & Cooking, Green Living, Nature Study, Outdoor Skills, and Horticulture for Health and Well-Being. School Group Classes: Students and their teachers can choose from a variety of class topics, including plant adaptations, seeds, rainforest ecology, trees, pollination and other nature-related topics. Primarily designed for elementary and secondary students. School Group Guided Tours: Themed guided educational walks of the Garden grounds. Teacher Professional Development: In-service and extended learning opportunities for educators in inquiry-based education techniques. Classes offer college credit for educators. ECO-ACT: A year-long environmental leadership course for high school students who teach ecology to elementary school children throughout the school year. Instructional Resources: The Stupp Teacher Instructional Resource Center serves as a centralized resource for books, instructional kits and audio-visual materials, many of which may be borrowed by community educators, and a center for instructional resource books and materials which teachers may use in planning and preparing instruction. GEMS and Discovery Unit Kits support instruction in science and math curriculum units, while Suitcase Science Kits contain easy-to-use science activity supplies and teaching aids. Missouri Botanical Garden videos and DVDs are designed for elementary and middle school classes, focusing on ecological concepts, biomes of the world, plant biology, and environmental issues. In addition, the Garden makes available curriculum materials focused on tropical rain forests, aquatic ecology, field study methods, lessons for self-guided trips to the Garden and pre-visit and post-visit materials for Garden field trips. Therapeutic Horticulture Programs: The Garden’s expert team of registered Horticultural Therapists offer a variety of nature-based programs and experiences to enrich and engage groups of all abilities at the Garden and in the community. In addition, the Zimmerman Sensory Garden is a special garden where Garden therapists utilize this interactive space with their clients. Drawing on the sights, smells, textures and sounds, visitors of all abilities enjoy everything this garden has to offer. Classes: Structured investigations in field ecology, natural history, living history and science in the outdoors for elementary, middle school and high school students. Tours: Naturalist-led guided walks or wagon tours of the Shaw Nature Reserve for adults. Adult Education Classes: Botany, ecology, natural history, photography, nature crafts, health and wellness, and outdoor skills classes for adults and families. Teacher Naturalists: Volunteer opportunities and training in ecology, natural history, and education enabling adults to work with school groups visiting the Nature Reserve. Dana Brown Overnight Education Center: Comfortable residential facility offering instruction in field studies, natural history, and ecology and living history for elementary and middle students and adults and families. Field Science Grants: Support for travel and research expenses to enable students and teachers to extend their classroom and community-based learning through field experiences at the Litzsinger Road Ecology Center. Internships: Internships provide high school and college students an extended opportunity to learn ecology, horticulture, and outdoor teaching skills. Volunteer Educator Program: An adult volunteer program providing participants with a foundation in ecology and education, enabling them to assist students in field science programs. Horticulture Volunteer Program: An adult volunteer program supporting a variety of ecological restoration projects. Conservation: Several research projects at the site focus on local ecology and the restoration of natural creek, woodland and prairie habitats.